Geordie Productions celebrates 36 years of acclaimed Theatre for Young Audiences with a new Artistic Director, new adventures, and new voices. Kicking off the season is the Canadian stage premiere of one of the world’s most legendary science fiction writers Ray Bradbury. The Halloween Tree, adapted for the stage and directed by Repercussion Theatre’s Artistic Director and longtime Geordie collaborator Amanda Kellock features an all-star cast and production team and takes families on an incredible, heartwarming (and just a little spooky) adventure about the origins of Halloween from October 21 to 30 at the D.B. Clarke Theatre in downtown Montreal. A group of excitable friends set out to go trick-or-treating on Halloween, only to discover that one of their closest pals, Joe Pipkin, has been whisked away on a journey that could determine whether he lives or dies. Through the help of a mysterious character named Carapace Clavicle Moundshroud, the group pursues their friend across time and space through various cultures and worlds, challenging their fears and confronting the unknown. For the holidays, Geordie joins forces with Montreal’s business and media community and invites families to rediscover a Christmas classic in an all-together new way. Under the creative direction of Mike Payette, 40 non-traditional thespians will offer a unique take on It’s A Wonderful Life. Based on the film by Frank Capra, and adapted for the stage by Philip Grecian, this staged radio play comes complete with live Foley sounds and other surprises. Doubling up as Geordie’s holiday gala fundraiser, the December 9 and 10 performances include après-show cocktail & canapé receptions as well as silent auctions of gifts to help ease the shopping needs of its patrons and supporters. A good cause and great event to help usher in the holiday season. In the spring, Geordie’s far-reaching and landmark 2Play Tour, which annually travels over 27,000km to present over 300 performances to 40,000 kids in elementary and high schools, CEGEPS and communities from the Iles de la Madeleine to Chibougamau, returns home to Montreal with much pomp! Both plays this year, Water Weight by Jesse Stong and Instant by Governor General’s Award laureate Erin Shields, directed by Mike Payette and former Artistic Director Dean Patrick Fleming, respectively, get the complete professional production treatment to the delight of Montreal families as part of the all-new Geordie Theatre Fest. Running from March 21 to 26, the Fest is a unique opportunity for local audiences to experience these shows in a way that has never been done before; playing in repertory at the historical Monument-National. They will be joined by Geordie’s most popular 2Play touring production to date, Marcus Youssef’s award-winning Jabber, directed by Amanda Kellock, which will be returning from a three-month tour to Ontario, the Maritimes, and the US. Geordie Theatre School, which empowers children and teens through the craft of stage performance, has partnered up with the Evenko Foundation to offer scholarships to benefit youth from lower economic backgrounds and give them access to engage in performing arts training with professional artists from the English acting community. GTS is proud to partner with Evenko, whose mission is to “support youth between the ages of 5 to 25 to engage in the performing arts in order to stimulate their creativity, improve their self-esteem and their desire to learn and grow” as well as “encourage emerging talent”. GTS, with the help of this new initiative, will allow even more youth to increase their confidence, creativity and craft through a dynamic introduction to theatre. Geordie Productions is Quebec’s English-language theatre company for kids, presenting professional live plays for young audiences since 1980. Based in Montreal, it delivers more than 300 performances across 27,000km each season. Its 2Play School Tour travels extensively from the Far North to all across Quebec, Ontario and the Maritimes, providing many communities their only opportunity to see live theatre. 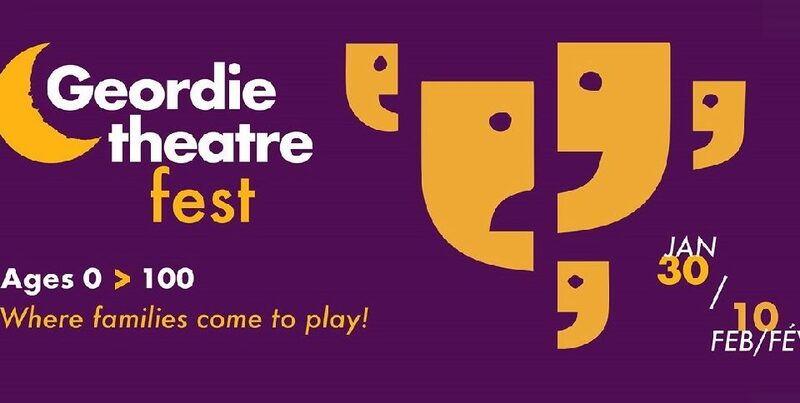 Geordie’s Mainstage Series presents both well-loved classics and exciting new works by contemporary Canadian playwrights to families and school groups in Montreal.